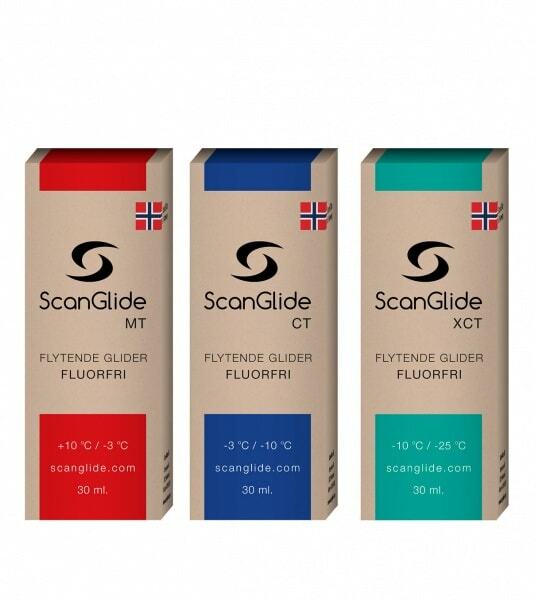 Home » Offer packages » Nanoglider MT, CT and XCT 30 ml. Purchase Nanoglider MT, CT and XCT 30 ml at a reduced price. Environmentally friendly and fluorinecarbon-free nanoglider to temperatures ranging from +10 to -3 degrees C. Suitable for all types of snow. Highly water and dirt repellent! Easy application. Apply with the sponge on the bottle. Ready for use just after a few minutes. The glider is very effective and stays on mile after mile. Clean first the ski base with ScanGlide Wax Remover. This conditions the base and opens the pores of the skibase allowing ScanGlide NanoGlider MT enter deep into the sole. A bottle of ScanGlide NanoGlider MT 30 ml. consumption to approximately 20-30 applications, so it is very durable in use. Environmentally friendly and fluor carbon free nanoglider to temperatures ranging from -3 to -10 degrees C. Suitable for all types of snow. Highly water and dirt repellent! Easy application. Apply with the sponge on the bottle. Ready for use just after a few minutes. The glider is very effective and stays on mile after mile. Clean first the ski base with ScanGlide Wax Remover. This conditions the base and opens the pores of the ski base allowing ScanGlide NanoGlider CT to enter deep into the sole. A bottle of ScanGlide NanoGlider CT 30 ml. consumption to approximately minimum 20-30 applications, so it is very durable in use. Environmentally friendly and fluor carbon free nanoglider to temperatures ranging from -10 to -25 degrees C. Suitable for all types of snow. Highly water and dirt repellent! Easy application. Apply with the sponge on the bottle. Ready for use just after a few minutes. The glider is very effective and stays on mile after mile. Clean first the ski base with ScanGlide Wax Remover. This conditions the base and opens the pores of the ski base allowing ScanGlide NanoGlider XCT to enter deep into the sole. A bottle of ScanGlide NanoGlider XCT 30 ml. consumption to approximately minimum 20-30 applications, so it is very durable in use.